C9 now has an option that permits your system to perform backups to backup servers online. The backup information is generated live as you use c9. If you modify an account, perform a sale, receive a stock order etc, then that vital information is automatically backed up onto servers on the internet within a few seconds. Restoring from a backup involves downloading a backup file from the internet. Backups are performed via messenger. 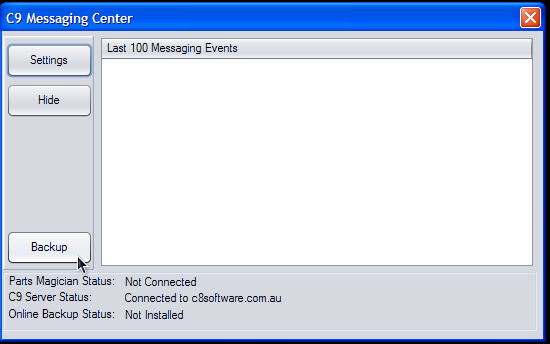 As information in your database changes messenger sends this, in encrypted/protected form, to c9's web server which is located in Melbourne, Australia. As an extra precaution this information is then also relayed to 3 different backup servers and a 4th CDP Solution. For backups to be consistently up-to-date you need reliable internet access. In the event that internet access is down, the online backup system will simply wait for service to come back online and then transmit information not yet successfully backed up. 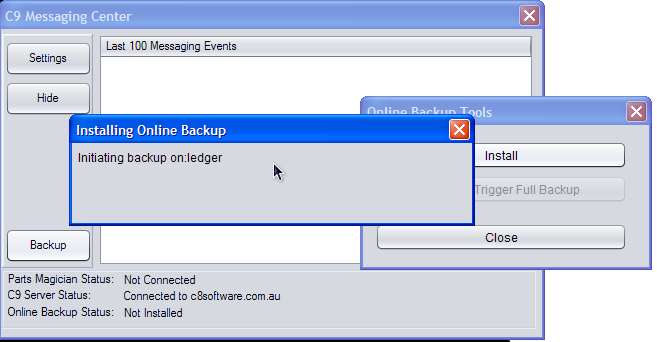 Firstly the online backup package needs to be enabled on your copy of c9. C9 support staff can arrange this remotely. 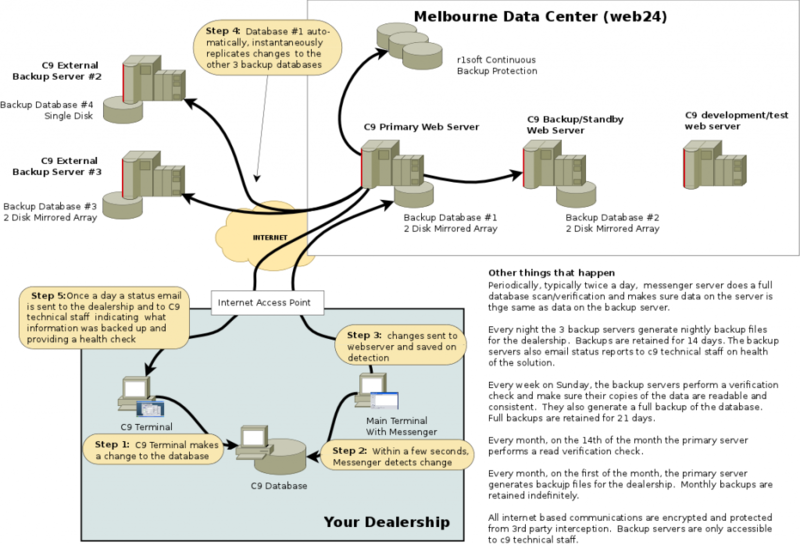 Because of operating costs for c9 webservers and network activity, online backup service incurrs a monthly surcharge of $33. Once package is enabled you need to exit all terminals and restart messenger program. Once messenger program is restarted, right click on the messenger icon and click on restore. At bottom of screen it should say "Online backup status: Not installed". Click on the bottom on bottom left: Backup. Then click on Install. And then click on continue once you have confirmed all terminals are not installed. The process takes about 10 minutes to complete, depending on how much data you have. Do not start any c9 terminals while this process is running. Once installed the backup process will in the background begin to perform the initial backup. You can see this at the bottom of the messenger screen. Typically it takes between 20 minutes and 2 hours, depending on your internet access speed and amount of data you have in c9. It is now safe to run c9 terminals. Once completed, Online Backup Status will report 'synced'. As you make changes to data, the system will temporarily change from 'synced' to 'Active. Backing Up' in order to copy changes. Only changes are copied, not the entire database so further changes are both fast and have minimal impact on you Internet Service Provider bandwidth limits. Once a day the backup system will send you an email indicating the status of your backup. The email is sent from Backup Server #2 so that it indicates the status of both online backups. If the web server has not received any backup information in the past 2 days. There are two additional settings you need to set in order to tune behaviour of backup. First is the email address that backup email notifications are sent to. The second is a password to use to recover backup data from the web server. You need to type in the name of the dealership and your password. Dealership name only need be part of the name. Example "Andrew's Motorcycles", you only need to type in Andrew. The password must be typed in correctly. Then click on the link to perform download of the backup file.